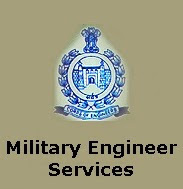 Military Engineer Services (MES) invites application for the post of 208 Semi-Skilled (Mate) in various trades. Apply before 10 November 2015. Educational Qualification : Matriculation or equivalent exam of recognized University/Board and Industrial Training Institute pass certificate from a recognized Institute in a relevant trade. How to Apply : Interested Candidates may apply in prescribed application from along with Self attested photocopies of educational qualification certificates, caste certificate and certificates in support of any claim / relaxation & One self-addressed envelopes of size 28 cm x 12 cm with postage stamp of Rs 60/- affixed on envelope send to HQ 133 Works Engrs (Srinagar), PIN-914133, C/o 56 APO OR HQ 135 Works Engrs (Akhnoor) PIN-914135, C/o 56 APO OR HQ 138 Works Engrs (Leh) PIN-914138, C/o 56 APO OR HQ CWE Udhampur PIN-900386, C/o 56 APO or on 10.11.2015. Last Date For Submission Of Application : 10.11.2015.